We are well into 2014. It seems that this year, like so many before, is moving more quickly than the last. Hopefully you’ve been able to take positive steps towards your goals and dreams, whatever they may be. 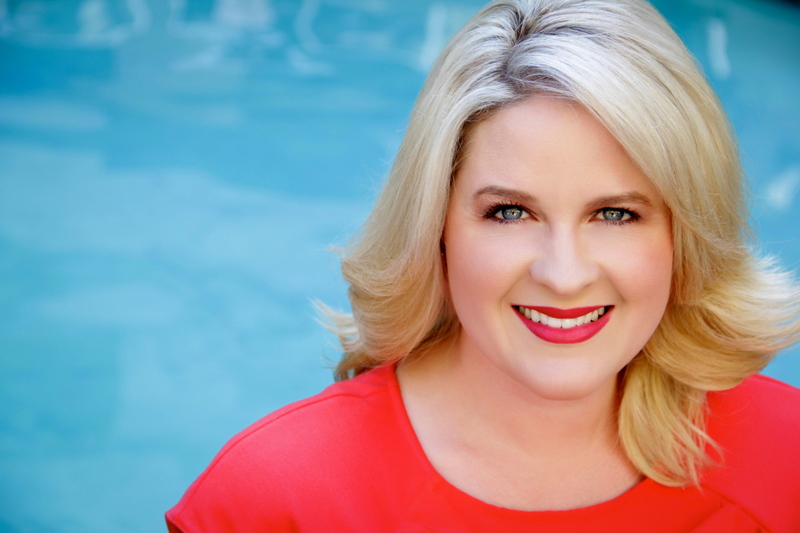 Filmmaker Angel Kristi Williams has taken 2014 head on. The Baltimore native is one of Film Independent’s Project Involve Fellows for 2014 – joining 29 other talented filmmakers. Her first short film, CHRISTMAS TREE, has been making festival rounds, and she is in pre-production on her next short, CHARLOTTE. CHARLOTTE, set in Baltimore, MD, explores the development and relationship of two young girls. At its heart, the film is an exploration of friendship and what it means to be a woman. The city of Baltimore, which played a key role in Williams’ development, serves as an additional character. Production is slated to begin the last week of March in Baltimore. Williams and her team are currently raising funds (via Seed & Spark, they have 2 days left to raise $11,000). Seed & Spark is pretty fantastic, because donors are able to see exactly how their money will be used. To find out more about the film, have a listen to Williams’ radio interview with the Marc Steiner Show and check out her feature in Indiewire. Meanwhile, Williams was kind enough to grant an interview! Have a peek into this filmmaker’s mind and share her campaign, if inclined. I was very young, probably about 8 years old. Every day after school I recorded a T.V. show with my younger brother. We had a VHS camcorder. It was pretty fancy too. I could edit and do effects in camera. I’d take notes in homeroom on Channel 1 (our school’s news programming) and report world, local, and entertainment news. Then we’d do a segment in the style of Arsenio Hall. Since it was just the 2 of us, my brother was forced to be ALL of my special guests. We stopped recording the show shortly after he refused to be Michael Jackson. What’s been the most difficult part of your journey as a creative? I think the most difficult part about being creative is knowing which stories to tell at what moment. Sometimes it feels great to have an idea in every pocket but it can be overwhelming as well. Right now I’m juggling ideas for my first feature. Why Baltimore? What has that city meant to you and what role did it play in your personal development? I was born and raised in West Baltimore. I became an adult in Baltimore and my entire family is there. I can’t wait to return there to live but right now my life is in Los Angeles for work. I just think it’s a beautiful little city. My heart will always be there. How is this story reflective of the stories you’d like to tell? I love provocative stories, ones that spark conversation and require participation from the audience. I like telling stories about characters that intrigue me in all their complexity. What creatives have been the most inspiring to you? Vittorio De Sica – Bicycle Thief, Theodore Witcher – Love Jones, Wong Kar Wai – In The Mood For Love and, Melina Matsoukas. I’m thankful for having the courage to follow this dream of being a feature filmmaker and my journey thus far. Three filmmakers have set out to discover how couples make their relationships last in the Global Glue Project docuseries. The docuseries features 56 couples, from all over the world, who have managed to stick together. Each pair discusses their triumphs, struggles, and how love continues to win. With many companies, the main concern is the BOTTOM LINE. Now, while it’s obvious that the bottom line is crucial to creating a sustainable business, I am also interested in something else, how the company is creating GOOD. In a sense, having a positive impact – serving as more than just a mechanism of consumption. That’s why I’m enamored with companies that mirror the TOMS 1 for 1 model, companies like Fortuned Culture. Founded by Azie Tesfai, Fortuned Culture is a jewelry company with the best of intentions. Tesfai, a woman of Eritrean descent, sells locally made jewelry with Ethiopian flare. She wants to remind consumers that they can make a difference with every dollar they spend. Why not buy something beautiful and help feed a group of children in the process? Her health bracelet, priced at $30, vows to give one child, in an Ethiopian school, 65 meals. Tesfai has selected charities that are close to her heart, in an effort to help women and children from various countries (currently Ethiopia and Mexico). All of her hard work caught the attention of TOMS. Fortuned Culture is now a part of TOMS Marketplace – an initiative working to change the consumer’s perspective on spending. Have you ever listened to someone and immediately felt inspired? That’s what happened when I spoke with Tesfai. Read about what’s inspired her and how she hopes to change the world, while connecting hundreds of cultures. Which came first, the chicken or the egg? Did you have an idea for a venture and then work to tie in the social impact or did you want to make an impact and then find a way to utilize your interests, connections, and strengths to form a company that could do so? I had designed jewelry my whole life – for myself and for friends. In a weird way, it’s kind of meditative to do. It relaxes me and I enjoy creating things. But, it was the charity that came first. I’m Eritrean and my family is in Ethiopia. I was working with a non-profit school, for some of the most underprivileged children in Ethiopia, and their meal program got pulled. The founder of the charity (The Fregenet Foundation) and I had lunch and he told me they were having a really hard time. You can’t educate hungry children. They’re not going to be able to focus, especially elementary age. So I thought, OK I’m going to help. I have enough friends. We’re going to raise some money to take care of the meal program, for at least a year, until they can figure something else out. I had a really hard time getting money. I’d get a donation pledge from a friend, then I wouldn’t hear back from them. I thought, this isn’t really a long-term way to help. Around that time, a girlfriend called me and asked me to make a bracelet I’d made for another friend’s birthday. I thought, why don’t I charge her for it and give the money to the charity? That’s how the idea formed. Why don’t I make it a really personal give? So, I came up with this idea of the health bracelet. It gave 65 meals to one child and it was a really simple pendant with, at the time, a wax cord. I’d sell it for $30. It would show my friends that so little goes a long way, and they’d have something tangible to show for it – this bracelet. And it worked really well. Then I thought, they need school supplies, books, uniforms, and help with salary for qualified teachers. It grew from there. It started with the extreme need and grew into a business. What’s been the most difficult part of running Fortuned Culture? For me, it’s been design. Because it started as a charity, the bracelets and necklaces are all supposed to be a part of a message. You wear it, and you’re telling a story of what you’re giving. These last couple of weeks have been kind of cool because I’ve run into people I don’t know and they tell me what the jewelry is for. And that was my point. I wanted them to talk about the children and the charities. With that, I also want to make it accessible for people to buy and give to their friends. So I made everything unisex, made everything one size fits all, and I tried to keep my price points really low, because I don’t want to exclude anyone. That’s really difficult when you’re designing new pieces. You have to make it for guys and girls. So a guy with a big wrist and a girl with a smaller wrist can both wear it and not look ridiculous. What have you learned from this venture? I’ve learned that so many people have really good hearts. Being, myself, from a third world country and Los Angeles and traveling between the two, I knew people wanted to do good. In founding this company, I’ve just come across people who have such huge hearts and want to help. That’s been such an inspiring realization. So many people want to do well for others and that’s been the most exciting development. How did your relationship with TOMS develop and how has their structure informed or helped you with Fortuned Culture’s operation? TOMS has been amazing. A couple of the employees were wearing necklaces and bracelets around the office. It was great because a few of the girls that worked there were buying pieces for gifts. I got an email asking if I would come in and meet with them. At the time, they weren’t saying it was Marketplace because it’s a huge undertaking for them. I told them what I did and they take it so seriously. They really look into your giving, your numbers, where you make the jewelry, and the materials you use. I mean, TOMS has worked so hard to make a good brand, they really want to make sure whoever they give the stamp of approval to is ethically in line with them. They’ve been so supportive. Everyone there has been really fantastic. What’s your process when selecting future beneficiaries? This is the thing that I probably spend the most time on. The first charity (The Fregenet Foundation) I’d worked with for years. The second, Corazon de Vida, I’d worked with for a long time as well. A lot of my close friends had been very involved – going (to Mexico) multiple times a year. They were both super close to me and I knew both founders very well. The founders have inspired me so much. I just thought, I have to help and get their stories out. I do it based on the founder, the charity, their cause, and then also on their giving. Both charities, and I have a couple more coming up for spring and summer, give me all of their numbers. I need to see what and how they give. If I’m going to bring a charity on board, I’ve done all the research for you and I’m co-signing it. I’m saying, this charity gives a huge amount of donations towards their cause and the founders are on-site working with the children. Vetting takes the most time by far. I go on site and meet with the founders. It literally takes me 6 months to make sure that this charity is the right cause. Ultimately, what’s your hope for Fortuned Culture, and what do you need to make that happen? My dream, and it’s a very visual concept, is to be able to go to the website, click on shop, and I want there to be hundreds of flags (now there are two for Mexico and Ethiopia). You can click and see hundreds of countries, go to the country you want, and find a charity associated with it. The whole idea of a “Fortuned Culture” is to get as many cultures involved in this movement as possible. I’ve always been a fan the motto “one world.” I like the idea of having a place where all these countries come together and help each other. Each country will have a new charity and a new collection. Any advice for entrepreneurs looking to make a social impact? Start with your passion. For me, my mom’s family is within blocks of the non-profit that we’re working with in Ethiopia. So it was super close to me. I knew the kids very well and that was my passion. Starting a business or charity is hard. It’s alot of work. So, you have to be super passionate about it. If the cause is close to your heart, you’re going to make it happen. If not, you’re going to quit. I know the moments where I wanted to quit, the only reason I kept going was because I knew these children. I knew they needed certain things. I couldn’t let it be that they wouldn’t get these things because I quit. You have to be connected to the cause and the people who will benefit. Make it something that you’re super passionate about. I am thankful that I was able, by a crazy series of events, to be raised in the United States. When I was born, I was the only one of my cousins who was not born in Ethiopia. So, I feel like that twist of fate is such a source of gratitude for me and why I feel I need to give back. There’s a reason why I was born here and my family is in East Africa. I’m thankful to have the opportunities I have. We’re so blessed here. We live in a land where you’re able to do whatever your heart desires, and that’s not true in most places. If you’re looking for a fabulous gift idea for this holiday season, be sure to visit Fortuned Culture. This is another chance to change the way you shop. Filmmakers Tupac Saavedra and Rebecca Montag ventured to Bolivia to follow a group of former street children in El Alto. These children participated in a theater therapy group, in an effort to cope with past trauma, associated with abuse, drug addiction, and abandonment. Saavedra documented the group’s experience putting on The Little Prince. 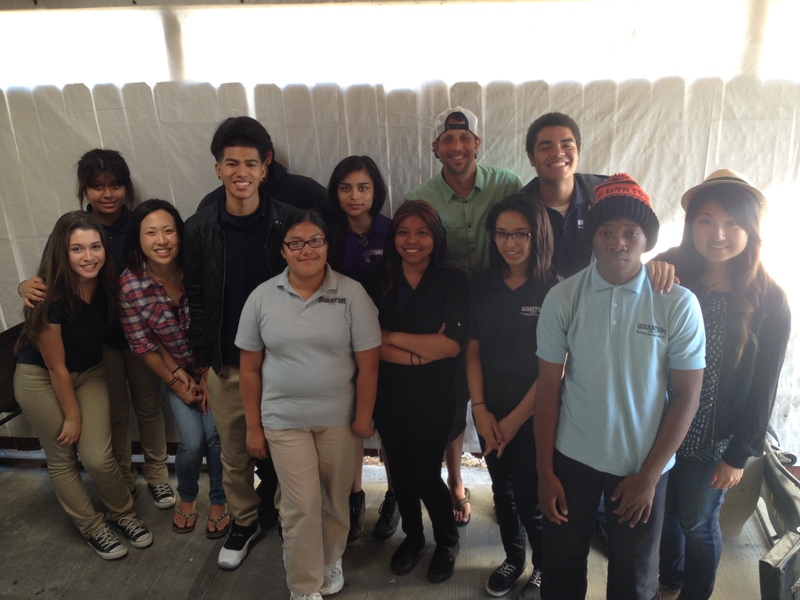 What began as a journey to show these children’s transformations quickly became a call to action, when the theatre program ended due to lack of funding. Now, Saavedra and Montag are using Kickstarter to go beyond production costs – they want to fund another 2 years of theater therapy, for the children who’ve shared a piece of their lives. Check out the Kickstarter for “The Little Prince of the Andes” here. And let this be a lesson, there’s always a way to make a difference. In 2012, Kirsty’s journey brought her from her home of Perth, Australia to Los Angeles, California. Since arriving, she’s employed a production team that helps her film KirstyTV from her LA apartment and broadcast online. Spraggon operates under the principal that stories have the potential to heal. As such, her guests often have overcome tough physical and emotional obstacles. Her hope is that in the telling of their stories, guests will help others dealing with similar issues. Thankfully, Spraggon was kind enough to let me turn the tables on her to discover what made her change careers, how KirstyTV makes a difference, and what it’s like being an entrepreneur 9,000 miles from home. Your philosophy is wonderful – I definitely think I’ve learned to break through my own fears by hearing about other people’s adventures. What influenced your decision to leave sales and venture into speaking and writing? Since I was about 15, I was doing public speaking competitions – I think the seed was first planted then. It’s interesting, when I was speaking people would ask, ‘What made you write the book or start the talk show?’ and I couldn’t pinpoint when that had happened. Six months after I moved to start speaking, I was reading one of my old journals and I’d literally written the day I left real estate, “I’m going off to become an international speaker, author, and T.V. host.” I was like what? I knew then? Growing up, my dad listened to Zig Ziglar and he was in sales. Then, at age 17 I started in the real estate industry. Growing up in that space you attend a lot of conferences with motivational speakers. I remember hearing one woman speak and saying “I want to make people feel like that.” Eventually, I saw there was a natural transition, if I was successful. How was the transition moving into a new industry? What was your biggest fear taking on a new career? Really, I sat down and had to think of my options. I called a girlfriend of mine who was an entrepreneur and talked to my mum. Literally the next day I went to work and resigned. And then I went, ‘What have I done?’ But no, I had to go through that to really commit to the next step. I don’t think I had a big fear going into it. I think it’s more that fears come up along the way. For instance, launching. I mean, I told everyone what I was doing and I’d moved. In launching, it was like, what if the content isn’t as good as I thought it was? There’s probably been a little more fear in the journey. But, ultimately, I would have been more afraid to not try. I could live with giving it a go and losing everything. What I was more afraid of was not going, not trying. I’m a different person than I was 18 months ago. I could live with giving it a go and losing everything. What I was more afraid of was not going, not trying. I’m a different person than I was 18 months ago. Well, that’s great that you had a support system! How have people from home responded? Everyone is proud. I remember hearing someone say, ‘I wish I could do it too.’ It made me a little sad, because everyone can go and do it. It makes me sad when people say they wish they could change jobs or move. I’m very careful on my show to illustrate both the highs and lows. I mean, I even showed my K-Mart Meltdown around my launch. I want them to know that it’s hard, but I’m still doing it. Living a life that’s inauthentic would be harder. One thing about entrepreneurship is that, while there’s still collaboration, really you’re building everything from the ground up. You must have full belief in your idea and put in the work to prove the concept, before you get any sort of acknowledgement . Has your journey ever felt lonely and what has been your key to coping with this? Yeah, it feels lonely alot. I think more so for me, because I’m not from this country. Not only do I feel isolated in this venture, but I don’t have my core support group from home. I’ve certainly made friends here, but I struggle to feel supported. I try to make sure that I don’t end up 24 hours a day working from my dining room – that will make anyone go crazy. I really do try to check in with myself and acknowledge what I’m feeling. There are really a gamut of emotions that you can feel as an entrepreneur that block you from doing your work. So, I’m constantly checking in with what I’m feeling and why, so that I can figure out what I need to do. I network as much as I can, and make sure I’m building meaningful relationships too. Hollywood is a very superficial place, you could go to three events and still not really connect with anyone. So actively seeking meaningful, authentic relationships has been important. Would you say that your practical experience in sales has been crucial to your new successes? I do think it’s helped with my motivational speaking and with the book – it’s all connected. If you’re an online host or personality, you’re building a brand. Speaking helps promote that, the show helps promote the speaking, and the speaking helps promote the book. They all layer one another. I definitely think sales helps with all of those. The reality is, no one is going to discover you under a rock. so unless you have content on YouTube, or a presence on Twitter, or you’re writing, whatever, you have to get your content out there. For me it’s not about pushy icky selling, it’s about building relationships. I tweet, I Facebook, I stay in touch via email and newsletters. The last couple of weeks we’ve had 2 or 3 tweets with Oprah. It’s a really wonderful thing to have someone of her caliber taking notice of what we’re doing. But this has all happened because I’ve put my content out there. You can do nothing and hope someone discovers you, or get to work and build your skill set. Ultimately, what are your goals for the show? It’s hard to say what this show will ultimately look like. Right now we’re focused on building the platform, definitely getting to a million views, maybe bringing the show live and having events. There’s nothing that I can dream of that I want to do that forces me to wait for someone to give me a TV show. I’m living my dream right now. The vision for the show wasn’t ‘I want to be the next big TV host like Oprah on network television.’ The vision was to have people watch the show and not feel so alone. To help people heal & we are already doing that so, my fulfillment isn’t dependent on a big deal. I am already living my dream. What advice would you give someone looking to make a career change? It’s such a loaded question. It can be dangerous as well for someone to say, oh just go do it. Yeah, go do it, but be prepared. Do it when you’re ready emotionally and financially. You have to be strong before you go off on this journey. Evey single person I know who’s done it has come up on naysayers, so you need to be ready emotionally. Financially, the realities are that you might not earn money for 3 – 6 months and up to a year, depending on what your business is. Find ways to prepare yourself. Before I left real estate, I was working on weekends and evenings on my next career change. I was working on business cards, updating my database, and creating a newsletter. Say for example, you want to open up your own bakery but you’re working as a secretary. Well, after hours you should be reading up, finding a mentor and hanging out with them on the weekends, designing your business cards, designing your website. There’s so much you can be doing. You don’t want to quit and have no money coming in, and that day start organizing this stuff. Prepare as much as you can mentally, emotionally, and financially. Go to conferences and educate yourself on the field you’d like to move into. So many things. I think I’m most thankful for the guests and the viewers. The people who support my dream and my vision. Because if I didn’t have my guests, I wouldn’t have a show. The show’s vision is to share stories that heal. So, it wouldn’t work if I had people who wouldn’t open up. So, I’m thankful that there are people who believe in what I’m doing enough that they want to be a part of that. Same with the viewers. They fill my heart up because they are all a part of the journey. It’s like one big family. I know people say it’s cliché, like I wouldn’t be where I am without you- but it’s true. Everyone is working to support healing and I’m thankful that we get to do the work of healing people through the show. It’s impressive to see someone who’s taken such a huge gamble on their dream to help others. While you may not want to be a writer or a talk show host, this is proof that with the right preparation you too can pursue new opportunities. If you’re interested in seeing KirstyTV, you can subscribe to her channel, check out her website www.kirstytv.com, and follow her on every form of social media (Twitter, Facebook). New episodes come out on Tuesdays and Thursdays at 3pm. Stay tuned. Meanwhile, check out one of Kirsty’s past interviews. What happens when you bring together a group of teens, remove the conventions of a classroom, encourage openness, and support everything from creative projects to emotional growth? Since finishing grad school, I haven’t set foot into anything that resembles a classroom. When I heard Jennifer Wong speak about her non-traditional after school group, I knew I had to see it for myself. So, I broke my fast to learn how one woman hoped to positively impact the lives of youth around her. One of three other adults, volunteer Dave Brubaker, has prepared a speech. He says, “Just so you know, I prepared something. I’m going to read it – but this goes to show, I was thinking about you even when you weren’t here.” Any doubts about his commitment to the group’s success were quieted. Brubaker’s speech, about finding your passion, make it clear that he aims to help these kids find their love and start pursing that, without fear, now. As part of the group share, Ms. Wong asks the students, “What do you struggle with?” Before visiting, I was warned that I would be asked to contribute. As promised, 30 minutes in, there are 20 strange eyeballs looking at me – and they’ll know if I’m BS’ing. I’ve just been put on the spot when one teen asks me, “What do you struggle with?” Well, at the moment, I’m struggling to come up with an honest answer that these teens will find acceptable, coming from a 20-something. After 5 seconds, I drop the pretense and confess. This is No Box Society. Jennifer Wong, a former teacher in the LAUSD, was looking for a better way to reach her students. A perfectionist, her job was difficult. Among the 230 students in her 9th grade class, she had kids with anywhere from a kindergarten to 11th grade reading level – and this one just one of many problems. “Someone’s needs were always not being met,” she lamented. 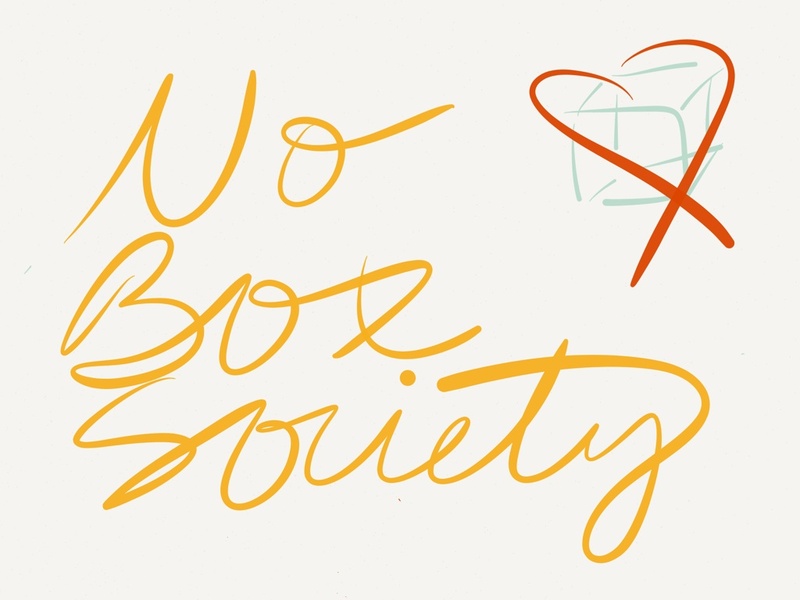 Ms. Wong quit her job and created No Box Society (NBS) as a way to address these issues. She explained, “After I quit, I wanted to see what it would be like to invest more intentionally into a smaller group of students…to see what could happen if I worked closely with individuals who exhibited intense creative, intellectual, or emotional giftings, students with strong potential rather than spreading my attention and resources so thin.” She recognized that maximizing their education and socialization extended beyond the classroom. Each of the kids shares common threads: they feel disconnected from their communities and as though they’re perceived as weird or too different. At it’s inception, the goal of No Box Society was to create a safe environment where students could feel comfortable discussing their struggles, come together, “speak good into one another,” and encourage growth. Ideally, NBS is a judgment free space where students help each other achieve and work through personal barriers. Ms. Wong jokes that her former co-workers refer to NBS as “Wong’s emotional afterschool group.” Whether or not this is the case, she has created an environment where kids feel comfortable being themselves, they aren’t afraid to make mistakes, they are exposed to new opportunities, and they’re learning what it means to “lift as you climb.” NBS is young, so they’re still working out the details, but it’s refreshing to know that there are people willing to dedicate their lives to something greater than themselves. And, who doesn’t find comfort knowing that someone is thinking of them, even when they aren’t around? I am thankful that no failure is ever final, that there is always hope, and that I can have the strength to get back up when I fall. I am thankful that each minute, each hour, each day offers new opportunities to create new beginnings. If you’d like to find out more or learn how to contribute to No Box Society drop me a line! One early August morning, my producing partner and I blazed down a dusty red dirt road in central Tanzania. Our 5 days filming, in a village near Moshi, were quite the eye opener. I was eager to return to our hotel and take the hot shower I’d dreamt about the previous nights. My skin had adapted to not showering, but my mind had not. Suddenly, an image smacked me back to reality. On the opposite side of the road, I spotted a villager carrying water in a bucket atop of her head. Another car quickly approached, its tires kicking up red dust. Just as I wondered how far that woman had come and how far she had yet to go, the car passed her, dirt blowing into her face and, undoubtably, her water. I was furious. What was she going to do with the water now? Prior to my recent trip to Africa, the idea of limited access to water was foreign to me. Of course, I was aware certain places were affected by the scarcity of water, but never having experienced it first hand, my connection to the issue was anecdotal at best. I had no idea what a morning without a 20 minute shower and a cup of tea looked like. If you’d asked me to donate to a clean water project in the developing world, I would have no concept of what the mission truly worked to remedy. In the U.S. we use on average 550 liters of water per person/per day. In the developing world, where water is scarce, that average drops to 4 liters. George McGraw (Founder/Executive Director) and DIGDEEP Water are looking to change this all together. DIGDEEP, founded 3 years ago, focuses on enforcing the international human right to water – simultaneously empowering its ‘shareholders,’ while engendering empathy in the hearts of its donors. With water access projects, as well as education and advocacy programs, in the South Sudan, Kashmir, New Mexico and Cameroon, DIGDEEP thinks of its beneficiaries as stakeholders. When educating the community about the importance of clean water, DIGDEEP takes into account important social and cultural aspects. Looking at the Holistic Individual helps create sustainable programs. McGraw notes that 50-70% of water projects fail because outside organizations do not take into account the community they seek to serve. Lack of cultural knowledge makes it nearly impossible to provide fundamental information, like the causation between clean water and healthy bodies. Additionally, McGraw says that other organizations withdraw without setting up the proper infrastructure. This creates a “painful transition” once organizations leave because women are forced out of work and young girls are forced out of school, when resources become scarce again. DIGDEEP partners with established organizations, in each affected area, so that once the infrastructure is established, communities are not only willing, but able to sustain their own clean water projects. So, how is DIGDEEP using Social Media for Social Good? McGraw hopes to create what he calls “authentic relationships” between donors and shareholders. This approach to clean water awareness and fundraising has led to the interactive 4 Liters Campaign. The 4 Liters campaign challenges fundraisers to live on just 4 liters of water for 5 days. Over the course of the 5 days, participants will share their experiences via social media, while raising funds for DIGDEEP’s initiatives. The Campaign kicks off today, October 14th! Give it a try, if only for a few days! 100% of funds raised go directly to DIGDEEP’s initiatives. When I asked McGraw what he was thankful for, he said, “the opportunity to witness gratitude and change in people’s lives.” I’m just thankful that he and his partners are encouraging active and educated philanthropy with a Human Rights-Based Approach. I love updates! This will be the first of many for folks featured on Thankful. Jewelry Designer Halle Richardson has been busy perfecting her craft. While working on her own designs, she hosts a blog, Romancing the Stones, where she discusses “jewelry and other shiny things that catch her eye. ” Really, her blog is an extension of her passion, a way that she stays educated and informed on happenings in the world of design. Richardson has quite the eye, if you’re in need in styling suggestions check out her blog. Because of her work on Romancing the Stones, Richardson was asked to co-host an event with Tiffany & Co. and Marie Claire Magazine in Atlanta. The event celebrated Tiffany & Co.’s release of their Atlas Collection. Richardson was joined by co-hosts Paris Rouzati of Sweet Lemon and Jade Lee of Jade Lee Events. Last night’s event had a wonderful turnout and was the perfect example of what awaits, if you pursue your passions. If you’re out there working hard, keep on keepin’ on.